At some point, everyone whose on a mission to lose weight hits a point where what worked before no longer does. 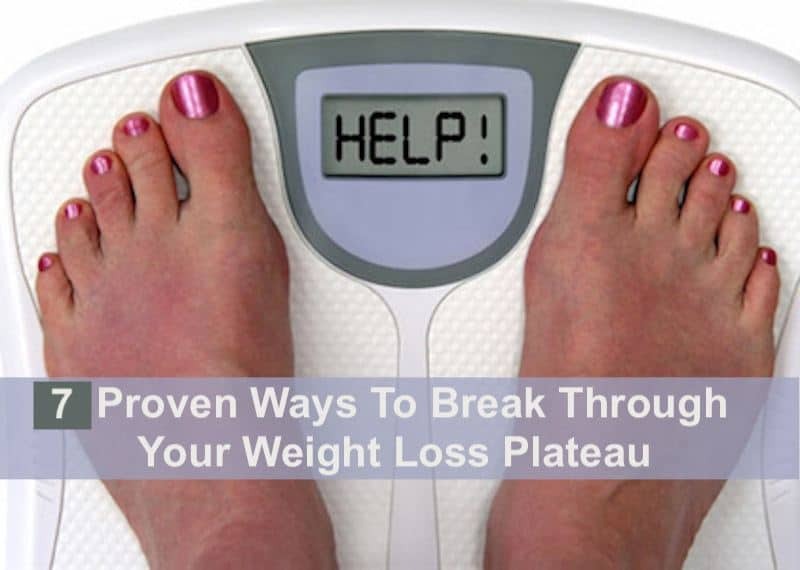 When that happens you need to know how to break through your weight loss plateau. Here are seven proven ways to do it. A FEW months ago I bookmarked an article by Dr. Mike Roussell about how to break through your weight loss plateau, thinking that he offers a good start that I’d like to elaborate upon. Dr. Roussell holds a degree in biochemistry from Hobart College and a doctorate in nutrition from Pennsylvania State University. His advice that you can break through your weight loss plateau by modulating caloric intake, increasing the intensity of your workouts and reducing cards is a fine start. But with a few more tweaks and considerations, you can amplify how quickly and sustainably you can lose weight. Homeostasis is the regulation and maintenance of our body’s internal environment within certain narrow ranges that support life, irrespective of changes in our external environment. I began Why You Can’t Outrun Your Fork and What To Do About It with a description of homeostasis using the example of body temperature and sugar. Say you’re walking through a snowstorm. It’s cold. Nonetheless, your body will do its utmost to keep your body at 96.8 degrees. Say whilst you jump step through the snow, you munch on a doughnut. Doing that will cause your blood sugar to spike. Then your pancreas will detect the sugar assault and get busy secreting insulin to make liver cells to “take up” this sugar in the blood. That sugar in that doughnut is acidic which may cause your blood pH to become too acidic, and thus your lungs and liver will act to bring down this acidosis in order to get pH down to the ideal acid/alkaline level of 7.40. Adjusting to cold weather and sugar are examples of homeostasis in action. Without this mechanism, you would freeze, become diabetic and get sick. The first three suggestions come from Roussell’s article, with my embellishments; the next five are my contribution to the effort. Don’t get too excited. This doesn’t mean you can pig out forever. Typically when you eat less you lose weight for awhile. Then the inevitable sticking point happens and the weight loss stops or slows way down. If you’re trying to lose weight and you hit a plateau, it makes good sense to assess what’s going on. Examine your diet and exercise. If the treats didn’t sneak back in, nor did the meal portions expand, then the plateau you’re on may be the result of a change in your basal metabolism, also called resting energy expenditure. Your body is always balancing energy in with energy out. For instance, say that your body used to need 2,500 calories per day to maintain its mass, and that reduction to 2,000 calories gave you the needed caloric deficit to lose body fat. But now you weight less and are at a weight that 2,000 calories maintains. What do you do break through your weight loss plateau? The common sense response is to cut calories again, and that’s probably what you’ll need to do. But, says Roussell, try increasing them first. Yes, this is counter-intuitive, and yet if you increase your calories (no more than 500 calories per day and mainly from high quality carbohydrates), your metabolism gets kick started again. After seven days of increased calories, cut back down, perhaps to less than the 2,000 in our example, and your weight loss will continue. This tip is the opposite of the first one, but it works just as well because both techniques disrupt homeostasis. Dropping your carbs down to a ketogenic level of 20 grams per day or less will compel your body to use fat as its primary fuel source. When that happens some of that fat you’ve stored from excess caloric consumption is used to provide energy for you body. Long time dieters can get into a continual quasi-effort to break through weight loss plateaus because their low effort output is sustainable over the long term. OK, could be, but what’s the point of sustaining something that doesn’t work, as those last ten resistant pounds of flab proves? In the exercise realm, a perfect example of this is the person who is always in the gym, but never strays from her slow motion, hardly-break-a-sweat cardio machine effort; so manageable that she can read a magazine at the same time. Year after year, the same routine and that ten pounds steadfastly sticks around. If his is you, you need to crank up the intensity applied to both the diet and exercise, at least in surges. By “surges”, I mean for a set amount of time, again to knock you out of homeostasis. So, if the only way you’ll consistently go to the gym is if you can read your favorite magazine, by all means do, but while you’re there take ten minutes out of your cardio session where you drop the magazine to the floor and crank up the intensity. In addition, choose a few days each month to increase the intensity in both the exercise and diet realms. Regarding your diet, try some form of Intermittent Fasting from time to time. There are many techniques from which to choose, which I’ve written about in several articles, such as Choose Your Favorite Intermittent Fasting Protocol (and watch the fat melt away). This one eludes me. I have to constantly remind myself to drink water. I often wonder if thirst is masquerading as hunger. Drinking a large glass of water before meals helps keep your stomach full and prevents you from overeating. It usually takes around 20 minutes for your brain to realize your stomach is full, so drinking plenty of water can help accelerate that process before you overeat. How simple can it get! “Apple cider vinegar has a voodoo-like reputation of being a cure-all for skin, hair and weight issues”, says Esquire. My sense is that too many health benefits are attributable to apple cider vinegar; however, researchers have found that acetic acid, the main component in apple cider vinegar, can suppress body fat accumulation and metabolic disorders. Mix a teaspoon or tablespoon into eight ounces of warm water and drink at times when you get a sense that hunger pangs are about to envelope you. This tip also comes via Esquire. Eating protein with each meal can help with weight loss and keep you fuller (satiated) longer. One study compared weight loss of participants eating a breakfast of either eggs or bagels, each with equal calories. Those who had the egg breakfast lost 65% more weight and 16% more body fat over the eight-week study period. Read that last sentence above and ask yourself if adding protein to your meals isn’t worthwhile. One tip that’s easy to do: If there’s no protein from whole food handy, make sure you have some high-quality protein powder around (hemp, pea and sprout-based protein powders are good choices) and include a smoothie with your protein-deficient meal — just make sure it doesn’t contain too many calories, which typically means, ditch the fruit. If you keep up with news about health matters, the ground-breaking research underscoring the importance of a balanced microbiome probably hasn’t escaped your notice. Scientific studies now clearly demonstrate importance of the beneficial microbes that inhabit your body, particularly in your gut. Body composition, immune function, various chronic diseases — even your brain and behavior and the rheumatoid arthritis that plagues so many of us — are all powerfully influenced by the type of strains of microbiota that populate your microbiome. He then cites a study conducted by a Japanese company, Snow Brand Milk Products. 87 overweight individuals were given 100 grams of fermented milk twice a day, half containing the bacteria Lactobacillus gasseri, half not. After 12 weeks those consuming Lactobacillus gasseri, the lost an average of 2.2 pounds—and there was no weight loss in the other group. Importantly, the fat they lost was in the areas associated with metabolic syndrome. They lost 4.6% of their visceral fat (fat around the stomach) and 3.3% of their subcutaneous fat (fat just under the skin). Their hip circumference was reduced by 1.7 cm (almost ¾ of an inch) and their waist went down by 1.5 cm (just over ½ inch). Such results are remarkable given that nothing else was changed in the diets of participants except the bacteria. Read my articles about your microbiome and get it tested at uBiome. If you want a run down on specific bacterial strains that can help you lose weight and benefit your health in many ways, as well as specific probiotics to try, check out Why The Right Gut Bacteria Is Essential To Good Health and How Antibiotics Kills It All. Under-eat and overeat for short bursts of time. Put more intensity into your exercise, either during your current program, or opting for a more intense program that you stay on for, say, one week every four. Drink more water. A good time to load up is during meal prep, but don’t dilute your digestive acids your stomach uses when you eat by drinking when eating. Add protein to your meals. Sip on apple cider vinegar in water (one tablespoon per eight ounces is a good ratio) in between meals. Take probiotics with the type of bacterium to help you lose weight. See this article for some choices.